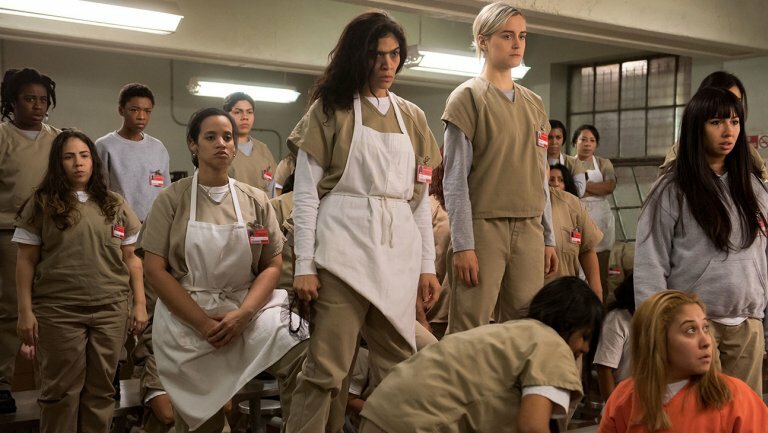 On “Orange is the New Black,” Do Black Lives Matter? I was late to this season of Orange is the New Black, but once I had the time to concentrate, I devoured the episodes in less than a week. Like the rest of the viewing audience, I was sickened and deeply saddened by the death of Poussey Washington (Samira Wiley), a beloved character (and my personal favorite on the show). Unlike some viewers, I was deeply conflicted about how I felt about the storytelling choices that lead to Poussey’s death and the storytelling choices that followed her death. Reading different analyses of the season left me with many questions about the storytelling choices. Was the choice to present Bayley sympathetically an indictment of systemic racism and racist institutions, or was it a tone-deaf cop-out? Did Bayley’s flashbacks actually make him sympathetic, or did they portray him as a privileged mediocre white dude who coasted through life? Did the focus on her friends’ grief and anger show respect to the grief and anger felt by black people when a black person is murdered, or was that ruined with cheap comic scenes of Flaca/Maritza and Leanne/Angie goofing off and not taking the death seriously? 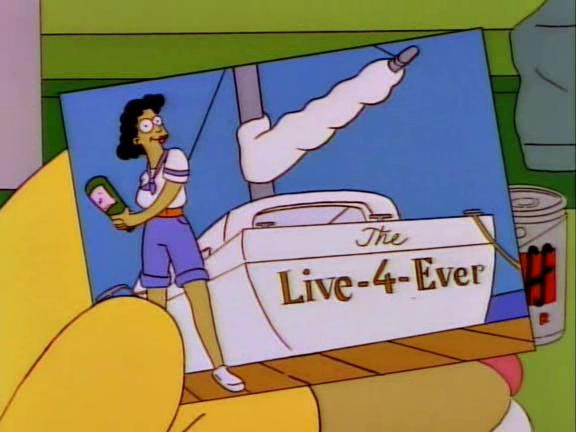 Was the buildup to Poussey’s death after a season of happiness appropriately tragic, or was it just a little too pat, like she and Brook Soso were two days away from retirement and just bought a boat called the Live 4-Ever? I could certainly have done without Flaca and Maritza’s stage-crying (even though I usually enjoy their scenes together), but the other questions weren’t as easy to answer, and they all lead to one larger, overarching question: did the show do justice to the issues important to Black Lives Matter while evoked real-life incidents of police killings of black people? There’s no question that the writers intentionally referenced real-life incidents in their story. Poussey’s life was choked out of her and she couldn’t breathe, like Eric Garner, and her body was left on the ground for hours, like Michael Brown. However, the events leading up to Poussey’s death were very different than the events preceding the deaths of Eric Garner, Michael Brown, or many other deaths of black people at the hands of the police. While only racists and/or knee-jerking defenders of police could attempt to justify the actions of, say, Timothy Loehmann (the killer of Tamir Rice), even the most passionate Black Lives Matter supporters who watched the end of episode 12 would have to admit that Bayley killing Poussey was an accident. He only went to restrain Suzanne because Piscatella ordered him to (he was just following orders). He couldn’t restrain Suzanne without harming her and making the situation worse (he wasn’t properly trained). He held down Poussey when she grabbed him from behind while trying to help Suzanne (he couldn’t see who was attacking him). He held her to the ground and she slowly suffocated in the din of the chaos around him (it was a chaotic situation and everyone was confused and emotional). In short, the show went out of its way to absolve Bayley of Poussey’s death even before he killed her. The choice to make Bayley sympathetic isn’t necessarily a problem in of itself. Had Poussey’s killer been one of the meaner or more violent COs, it would be too easy for white viewers to disassociate themselves from that character. An overtly sadistic villain would be easier to tolerate than an entire dehumanizing system. In fact, in one of the smarter moves of the show, the company that owns the prison tries to make Bayley a one-dimensional villain in the media to make the death of a prisoner easier to swallow. An easy problem with an easy solution – get rid of that one violent guard and the violence problem is resolved! The problem is that, while the show is clear on its position on violence, it is less clear on its position on systemic racist violence. However, while they are terrible people, they are not necessarily racist terrible people. We did see plenty of overt racist comments come from other characters this season, but those characters were all other prisoners brought together by Piper “Oops I Created a Hate Group” Chapman, and none of them are meant to be taken seriously. They’re used as dark comic relief…until the violence from the COs becomes too much for them and they approach Taystee and Maria to join forces against a common enemy. Because the corporation of MCC, above all else, is portrayed as the real villain of the season. They’re the ones who wanted to hire untrained guards and cut corners. They’re the ones who immediately went to villainize Poussey and make a black woman responsible for her own death – but once they saw that the task was impossible due to her low-level crime, pretty face and smile, and respected military family, they changed course and decided to make Bayley the villain instead. They traded her photoshopped “thuggish” picture with his Halloween costume as Rambo. In the eyes of MCC, a white straight man and a black lesbian woman were equally dispensable, both props in their corporate narrative. But straight white men and black lesbian women are not viewed equally in our society. We cannot write off all of the ills in our society as the result of corporate greed. Male privilege, white privilege, and straight privilege are all challenged, but they still exist. To make Bayley and Poussey equal victims of a colorblind classist system is egregious, but to make them equal victims in a storyline that obviously and explicitly refers to real-life events of police violence against black people is a different level of tone-deaf. Ironically, the writers did seem aware of the differences in Bayley and Poussey’s privilege in the flashbacks that preceded Poussey’s death. I don’t think it’s a coincidence that Bayley is shown getting a slap on the wrist for a low-level crime while Poussey gets 6 years in federal prison for a similar offense. But the events preceding and following her death indicate a different agenda – to place blame on systemic, corporate (but not necessarily race-based!) greed and show sensitivity to the feelings of white liberal viewers. So – does Orange is the New Black do justice to Black Lives Matter? In my estimation as an anti-racist white woman…Yes. And No. I want to believe that the writers had a specifically anti-racist agenda, and I think they tried to implement it. I look at Caputo’s last action of the season, to reject the script MCC gave him and defend Bayley, and I believe that we’re meant to side with Taystee and the other inmates in anger and betrayal. I believe that, while Caputo had the best of intentions, he made the situation worse by erasing Poussey in his speech altogether, and we’re meant to empathize with but ultimately condemn this action. But this is also a show that, a few episodes prior, had Linda From Purchasing hold a gun to Crystal Burset when she (Crystal) was defending her transgender wife. A white woman held a gun to a black woman’s face, and Caputo was turned on by this, and the scene was played for laughs. This leads me to think that the writers believe that Black Lives Matter. They believe that racism is bad…unless it can be played for comedy, and corporate greed is worse anyway.